Make the Right Choice for your Loved One: As the area`s leading Private Homecare provider, we offer the very best, compassionate care for the elderly and Disabled. It is our goal to improve the physical, emotional and spiritual wellness or our clients, and that is exactly what we do- Every Day! We will work with you to evaluate the level of care that is necessary to improve your loved one`s quality of life. We offer a variety of services to give our clients the specific care they need at the comfort of their own home. With our Friendly Staff with over 12 years of experience in staffing and coordinating, we are sure that we will Taylor fit Mom or Dads needs. A Love for Homecare Bonds & Insures all of our friendly and extremely understanding Care Givers to prevent our clients from any Liability. We carefully screen our Care givers with extensive background checks, including motor vehicle record history, social security validation and diligent reference checks. All of our experienced care givers are handpicked by our experienced staff managers and are required to have 2 plus years of experience caring for the elderly or disabled. Your loved one deserves to have all the comforts of home-and that`s exactly where we`ll care for them. Covered by Professional Liability, Insurance & Workers Comp. 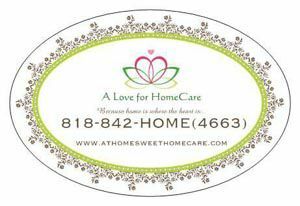 Available: A Love for Homecare representative is available to talk to you in person 24 hours per day, 7 days per week. Contact us today-and see how we can make a difference in your loved one`s life.